Sometimes, it's the totally wrong things that feel so right. And at Wrong Ramen, everything's just so right. Wrong Ramen is a cool new ramen joint offering both traditional as well as surprising new ramen creations that typify Wrong Ramen's quirky and offbeat vibe. Like The Communist, a unique ramen concoction inspired by spicy Chinese hotpots with seven Asian spices; or the F. U. Ramen, topped with Black Pepper Spam, crisp bacon, and fried egg on a garlic pepper broth, a cool breakfast in a bowl. Wrong ramen? Not just yet...sounds right to me. Classic American comfort food and breakfast served all day, can't beat that. And at Maple, you get your favorite comfort food from pancakes to signature main dishes, classic favorites and cool new takes. Think level up comfort food. Now that's cool. The newest family restaurant concept from the Pancake House Group, Maple takes classic American comfort food a notch higher with its wide array of dishes that are both comforting and familiar, yet new and different with Maple's unique touch. Using the very best and freshest ingredients, simple comfort food is elevated to a much higher level for one awesome dining experience. Dwight Ashton, Maple's Project Leader, brings the Maple concept to life through its relaxed, casual yet elegant decor all the way to its signature dishes. Currently with nine concepts under the Pancake House Group, including Pancake House, Dencio's, Yellow Cab, Le Coeur de France, Teriyaki Boy and Sizzlin' Pepper Steak, Maple is definitely a cool addition to the Pancake House Group's growing portfolio. As the sun sets, the fresh and imported ingredients are arranged and weighed based on traditional Japanese recipes. In the fading afternoon light, it's time once again to prepare another batch of fresh noodles for the dinner service at Mitsuyado Sei-Men, The House of Tsukemen. Like clockwork, the process repeats a daily cycle, every single day. Freshly made at least twice a day, the noodles at Mitsuyado Sei-Men, The House of Tsukemen, have a distinct firmness and flavor that can only come from noodles made just a few hours earlier. Using premium ingredients imported from Japan, the noodles at Mitsuyado Sei-Men are as authentic as it can be, rustic and traditional, providing a rich flavor in every bite. There's always something special when friends and family gather round a blazing bonfire, and childhood memories are filled with moments like these. And it's the food that make these moments a little more special. Classic comfort food shared with friends and family over a fire, nothing beats that. And at Bonfire, it's all about classic comfort food with celebrity chef Tristan Encarnacion's touch. At Bonfire, the extensive selection of cool comfort food recaptures that feeling with friends and family. Pizza, pasta, ribs, barbecue and Smores, in a cool and casual place. Each dish is simply presented, yet there is a subtle elegance in the plating, and you know there's a master chef in Bonfire's kitchen. And here's the cool part. You get your favorite classic comfort food at surprisingly reasonable prices. The dynamic duo behind Bono Artisanal Gelato are at it again...churning out magical flavors and surprising combinations to remind you why you just love this place. For Bono Artisanal Gelato's Rea and Zarah, it's just another day in the office. But for the lucky few invited to sample the new flavors, it was a game changing afternoon. A few spoonfuls immediately transports you to a happy place, and the new flavors definitely hits the spot. Established thirteen years ago by Caroline Nam in Korea, Mad for Garlic now has over 22 locations in Korea, Indonesia and Singapore, and it continues its regional expansion with its first restaurant in the Philippines. A lover of Italian cuisine, Caroline Nam soon realized that Koreans also loved garlic with a passion. Building on her love for classic Italian dishes and the popularity of garlic, Caroline Nam and her team created the Mad for Garlic concept. Twenty-three branches later, and counting, Carline Nam's garlic-inspired dishes continue to be popular and remains her distinct edge. Global Restaurant Concepts, Inc., the same group behind CPK, PF Chang's, Morelli's Gelato, IHOP and Gyu-Kaku, now brings this cool Italian wine bistro concept to Manila with its innovative garlic-themed cuisine. Once a year, budding food entrepreneurs converge for a sneak peek at their tasty creations. And like the food, the people behind the food always make Best Food Forward a much anticipated event. And this year's edition featured some amazing food, and people. Cupcakes by Ronna's Sweet Treats at Best Food Forward. Singapore's popular and iconic restaurant, Crystal Jade Dining IN, is now in Manila bringing authentic Cantonese cuisine with its first branch at The Fort. Now one can experience real Cantonese dishes based on traditional recipes in a modern and elegant setting, giving you more options when dining out at The Fort. With over 100 restaurants in Singapore, Malaysia, Indonesia, Thailand, Vietnam, China, Korea and Japan, Crystal Jade Dining IN is the first fine dining restaurant of the Crystal Jade Culinary Concepts Holding in Manila. A recipient of numerous awards, including inclusion in the Singapore Tatler's list of Singapore's Best Restaurants and the Miele Guide's Top 500 Asia's Finest Restaurants, you can expect the very best Cantonese cuisine at Crystal Jade Dining IN. Classic Italian food the way it should be, rustic and traditional, simple yet full of flavor using the finest and freshest ingredients. Located inside a mall, one finds comforting Italian dishes based on traditional recipes in its extensive menu, something you don't normally expect with its mall location. Nothing is adjusted to suit the noticeably sweeter note popular among most diners as each dish remains true to its origin and flavor. Handmade noodles made fresh daily and authentic ingredients imported from Italy add to the rustic charm of Pagliacci. Finally, Certified Angus Beef is now available at your nearest SM Supermarket, one more reason to make it your favorite supermarket destination. The country's largest retail chain, SM Supermarket has "beefed up" its fresh meat selection by offering some of the best beef products available at reasonable prices. Premium beef in a variety of cuts to satisfy all your cravings, from steaks, juicy roasts to burgers. Chateau de France opens its first branch at SM Makati, providing shoppers a real taste of France with its extensive line of freshly baked breads, imported cheese and cold cuts, and delicate pastries. Including a full line of exquisite macarons that are definitely a must-try. Crisp fried chicken wings. There's definitely a lot more to Brothers Burger than its signature designer burgers. And for the month of April, Brothers Burger introduces its mouthwatering new Chicken Wings. One more reason to drop by Brothers Burger. Each order includes six pieces of perfectly crisp wings marinated with special herbs and spices, available in Barbecue and Garlic Parmesan. You may opt for the classic chicken wings with the Barbecue or Garlic Parmesan dip as well. A perfect pair with your favorite designer burger or even as a filling snack in-between meals, the new Chicken Wings don't disappoint. Each crisp bite bursts with flavor, and the tender, juicy meat contrasts with the crispy outer layer for a delicious blend of textures. Nice. Bacon and Pork Sisig Shawarma? You better believe it. Nothing like a shawarma to cap a late night at The Fort Strip. And Shawarma Guys is definitely the place for traditional shawarma, and some inventive new combos. From the same group behind Relik and URBN Bar & Restaurant, comes a new resto concept offering a full range of cool Middle Eastern and Indian cuisine bannered by traditional and inventive Shawarma dishes that's just perfect after some serious clubbing at The Fort Strip. Real food that's simple, easy and fun, yet big on flavor. Just another day at Sabrina's Kitchen. Sabrina's Kitchen is a weekly 30-minute cooking show on the Asian Food Channel hosted by one of Manila's food and entertaining enthusiasts, Sabrina Artadi. In her kitchen, Sabrina brings real home cooked comfort food to life with a cool bohemian flair that's just so much fun to watch, and better yet, taste. And keeping it real adds a distinct personal touch, as Sabrina's casual approach to her favorite dishes is "not too perfect or styled." Instead, Sabrina finds perfection in life's little imperfections. Now that's cool. Ever since it opened way back in 2002, The Farm at San Benito remains the only resort destination in the country that offers holistic healing and wellness with its unique detoxification cleansing retreats and raw living food cuisine from its award winning Alive restaurant. And key to every healing "journey" at The Farm is its nourishing cuisine designed to help you rebuild and renew, and restore balance that add to the transformational experience at The Farm. Specializing in the freshest, organic ingredients in its purest form, The Farm's Alive Restaurant offers some of the most flavorful yet healthy dishes. At The Farm you'll find some of your favorite dishes on the menu, from pates and crackers to a variety of main dishes to surprising treats like freshly made ice cream and cookies. The Farm prepares all its dishes by soaking, blending, dehydration and culturing, locking in the freshness and nutrients and transforming these dishes with the creative culinary flair of The Farm's award-winning chefs. 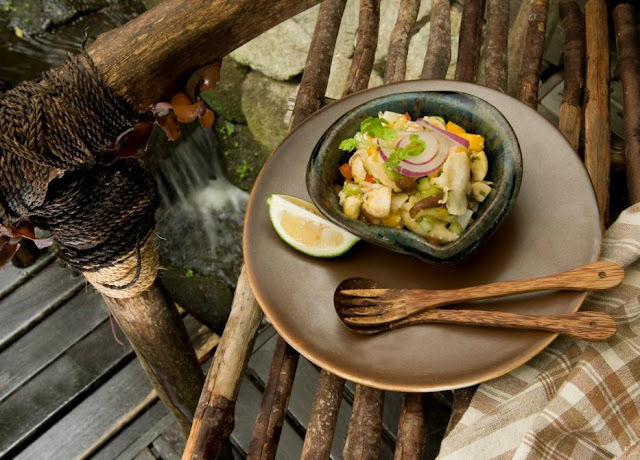 The Farm's unique take on the classic South American dish Ceviche is reinvented with mushrooms replacing the traditional fish. The light and refreshing flavor is maintained, with a cooling hint of chile, in this new yet familiar dish. Finally, there's a place for real German dishes, and excellent German beer. Brotzeit German Bier & Restaurant offers authentic Bavarian cuisine and the world famous Paulaner brand of beers from Munich, offering diners a taste of Bavaria right here in the metro. Here's the real scoop. Authentic Italian gelato, probably the best in the metro. Right here at Bono Artisanal Gelato. Authentic Italian gelato in familiar flavors, and new surprising flavors. Traditional artisanal techniques from the old world in one cool spot. A variety of flavors and great coffee too. You'll find it all here at Bono Artisanal Gelato. The extensive dessert selection at Market Cafe is also quite impressive, and deserved a separate post to give you a better idea of the selection. And after an awesome surf and turf buffet experience at Market Cafe, a dessert buffet seemed like a perfect way to cap the feast. In case you missed my post on Market Cafe's Seafood and Steak buffet, simply click on this link: http://dude4food.blogspot.com/2013/03/surfs-up-at-hyatts-market-cafe-seafood.html.